Mom and I have been keepin’ a big secret for the past month and a half – we didn’t tell anyone else in my family that I was flying home for the weekend. We had fun planning ways to surprise my dad and my sister (my brother’s in Denmark on a study abroad program, lucky boy! ), and they were both shocked and delighted to see me. It was pretty hilarious, too – I dressed up as my sister and curled up on the couch with her laptop, and when my dad came home, I pretended I was her. I can do a passable impression of her voice, and since she always wears a hoodie with the hood up, he couldn’t see my face. So he thought I was Rhiannon, and then was utterly confused when the real Rhiannon came into the living room and greeted him. Muahaha! Classic. The whole weekend was really pretty wonderful. Some of our family from Maine came down, and Mom, Rhiannon, my cousin, and I talked into the wee hours of the morn on the night before Easter. On Easter morning, Rhiannon and I hid candy-filled plastic eggs for the kids, who enjoyed the hunt. Heck, I enjoyed it too – it was 65+ degrees out! After all that egg hiding and hunting, though, we were ready for dinner. Dinner was pretty momentous because we had a totally vegetarian meal. Given that at least one of my aunts is a pretty diehard omnivore, this was really notable. Dad made stuffed manicotti; some were stuffed with cheese and then others were stuffed with a vegan spinach, artichoke, and mushroom mixture. All our side veggies were vegan, too. 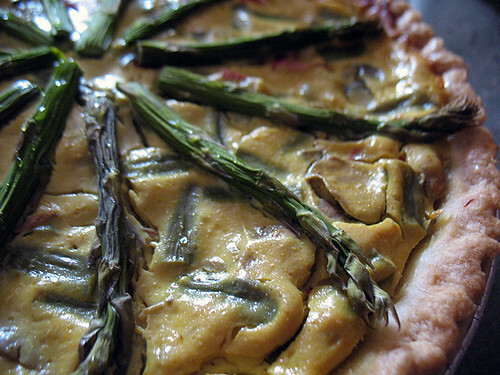 I contributed by cooking up a really impressive recipe from the FatFree Vegan Kitchen – a delightful Asparagus and Mushroom Quiche. Ain't no eggs here, baby! I’ll admit that I used a store-bought regular crust instead of making the brown rice crust, but other than that (and a sad lack of onion powder in my parents’ pantry!) I followed Susan’s recipe down to the letter. 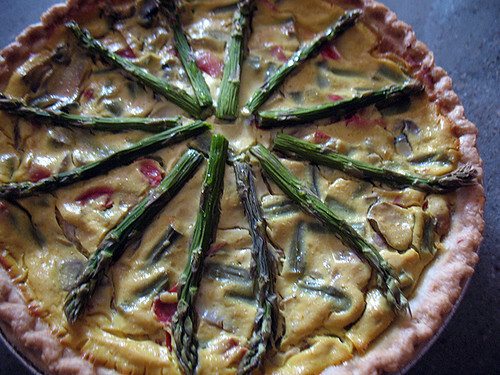 I was really pleased with the results, too – I loved the quiche’s creamy texture. Mom thought this was fabulous; she enjoyed it even more than I did! All in all, I had a really wonderful Easter break. The only bad part was catching a flight out of Rhode Island at 6:00 Monday morning, getting into Madison at 10:15, and then heading into work for noon. Yuck-o-rama! Such is the life of a working woman, however. Anyway, hope that those of you who celebrate it had a lovely holiday! Ciao! I could go for a piece of this right now... too bad the leftovers are in RI!